Are you trying to decide whether you should include tile in your bathroom renovation? First, it is important to understand the differences among the various types of bathroom tile that are available to choose from. This will help ensure that you are getting the most for your money and will be happy with your new bathroom. Ceramic tile is often the most popular choice for tiling a bathroom. It offers many different colors and textures that can make your decision difficult if you do not have a specific design in mind. In addition to normal-sized tiles, you will be able to find accent details such as edging and nosing, chair rails, and soap dishes that you can use to make your bathroom tile design uniquely your own. You save money when choosing ceramic tile because it is less expensive than porcelain, so it’s easier on your design budget. With its durable finish, the tiles are very easy to maintain, with nothing more than a mild household detergent and a nylon scrub brush. 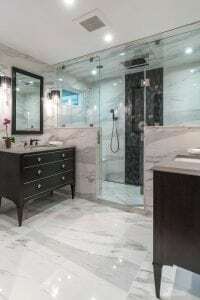 For the best selection of bathroom tile, call the experts at Conestoga Tile or visit one of their three showrooms in Baltimore, MD; Harrisburg, PA; and Sterling, VA.